Today CCI blogged about the abundance of screenings and panels at the Horton Theatre. This year's offerings look great; I know people are very excited about Mystery Science Theater 3000 panel and the Netflix Thursday night screening, while old favorites like Princess Mononoke are sure to draw a crowd. However, accessing these Horton panels has been something of a bugaboo in the past. If you just show up at the theatre, as many attendees do, you'll be begging for any leftover tickets. That's not going to work for anything popular. What you need to do: show up at the Sails Pavilion each morning and get in a specific line. If there are numerous people who want tickets to a certain event, there will be a drawing; other times they just hand out 2 tickets per person. Sounds simple enough, right? The problem is that attendees repeatedly can't find the right line and volunteers can't tell them. I've gone through this 3 times, being told there was no such line, being directed to the wrong line, or talking to staff who had no idea what I was talking about. One year we were even told to move by staff who were positive there was no such thing as someone handing out tickets for the Horton. Every year I hear from people who wanted to go to a certain screening and missed it because they couldn't find the person who had tickets. I don't know why there's been so much confusion in the past; maybe it'll be rectified this year. But here's my advice. If hitting a specific Horton panel matters to you, get upstairs in the convention center well before 9 am. Start with the hall outside Ballroom 20 and ask staff where the line for the ticket drawing is. If they don't know, start a line. If you see other attendees hovering in the area with a puzzled look, ask if they're waiting for the same thing and get them in your line. Keep pestering the local staff. If all else fails, just go to the Horton before your panel. And as with everything, don't hesitate to ask on Twitter if anyone has an extra ticket. Things come up and people realize they can't make a panel after all. Just like bag exchanges and wristbands, attendees are always willing to share and assist. You just have to be proactive. 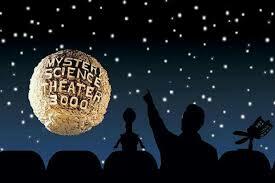 Valerie did you know the MST3K tour is coming to San Diego at the Balboa Theatre? Tickets are still available le. Also, what hAppened to your nightly updates? We looked forward to those. Hi, I did know about that. I was intending to do the regular daily summaries this year but unfortunately my schedule is all-consuming right now and my blogging time is quite limited. A sacrifice had to be made. And honestly, there are so many Con blogs that cover that stuff, I think everyone can find it if they need to. Have fun at the tour if you're going. Looks like a great time.